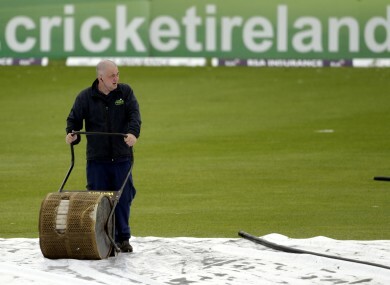 The one-day international between Ireland ans Australia has been abandoned due to poor weather conditions. A groundsman attempts to clear the water at Storment. PERSISTENT RAIN HAS forced Australia’s one-off warm-up ODI against Ireland to be called off just 10 overs into Ireland’s innings. Brett Lee sparked Australia with two wickets in his first three deliveries in an opening that also saw a spectacular catch from captain Michael Clarke before 24 hours of rain proved too much in Belfast. Lee was making his first appearance of the tour in the lead-in to a five-game ODI series with England and knocked over William Porterfield’s off-stump for a golden duck as well as Ed Joyce’s two balls later to complete a two-wicket maiden. Opener Paul Stirling managed four boundaries in his 24 but fell to teenage quick Pat Cummins in his third over to see Ireland slump to 36-3 before play was called off. Clarke won the toss and sent Ireland in, but after 45-minute delay to the scheduled start, barely 10 overs were bowled before the teams were forced off by the final heavy downpour. Australia was looking to use the match to give all their bowlers a run with Lee, Cummins and Ben Hilfenhaus coming in for Mitchell Johnson, James Pattinson and Clint McKay from the side that beat Leicestershire in the opening match of the tour. Email “Rain cuts play short at Stormont”. Feedback on “Rain cuts play short at Stormont”.